Doncaster (Vic). The exclusive new BMW ALPINA B7 Bi-Turbo excites the senses with thrilling performance, precision dynamics paired with luxury and comfort at the highest level. New generation 4.4 litre V8 engine with Bi-Turbo charging, petrol direct injection and Valvetronic delivers 447 kW and maximum torque of 800 Nm. 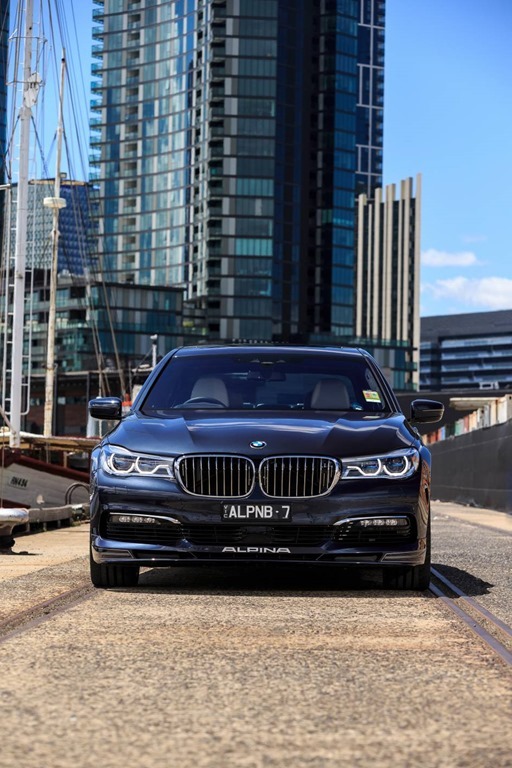 The new BMW ALPINA B7 Bi-Turbo impresses with class-leading performance figures in the segment of luxury performance sedans: from 0 to 100 km/h in just 4.2 seconds, with a top speed of 330 km/h. Modern and perfectly matched suspension technologies offer an unrivalled breadth of driving experiences, characterised by sharp, dynamic handling and outstanding comfort. The rear wheel steering of the Integral Active Steering system combined with the light and extremely rigid BMW 7 Series body with Carbon Core provides not only very direct handling but also a level of agility that is usually the domain of smaller performance vehicles. Special ALPINA Sport+ Mode adjusts all vehicle, drivetrain and suspension settings to maximum dynamic performance at the touch of a button and lowers the ride height by 20 mm for more agility and high speed stability. The ALPINA stainless steel sports exhaust system with two twin-tailpipes features active exhaust valves and delivers a sporty, sonorous soundtrack. ► Weight-optimised ALPINA CLASSIC 21“ forged wheels with twenty spokes and visible wheel bolts with a minimalist motorsport design. ► Luxurious ambience, refined materials of the highest quality and a modern, clear interior design with discreet ALPINA details. The hand-finished ALPINA sports steering wheel finished in finest LAVALINA leather with blue/green stitching adds to the bespoke nature of the vehicle. ► Digital, full-colour ALPINA instrument panel in LED technology in a distinctive and exclusive design, with ALPINA and B7 Bi-Turbo inscription and central digital speed read-out. Choice of three individual display options – classic blue instruments with red needles in Comfort Mode, blue/green dials and drag indicators in Sport Mode and an Eco Pro display. ► Reserved exclusively for BMW ALPINA automobiles – luxury interior trim in Piano lacquer or Myrtle luxury wood and two unique metallic paint finishes ALPINA Blue and ALPINA Green. Cutting-edge BMW engine technology and intensive development work carried out by ALPINA means output and torque are raised to a whole new level in the BMW ALPINA B7 Bi-Turbo. The new 4.4 litre V8 engine with Bi-Turbo charging, petrol direct injection and Valvetronic delivers an impressive output of 447 kW between 5750 and 6250 rpm, while the maximum torque of 800 Nm is available from 3000 rpm. In addition to the depth of ALPINA’s engineering expertise a number of significant technical details are responsible for the engine’s power output and performance characteristics – especially with regards to air intake system, the intercooler and turbocharger configuration and the high-performance cooling system. The Bi-Turbo charging system comprises two specially developed turbochargers positioned in the V of the 8-cylinder engine with optimised twin-scroll turbocharger housings and compressor wheels with enlarged inlet and outlet diameters. In combination with appropriately sized turbines this configuration ensures very effective use of exhaust gas energy even at low engine speeds. The result is a fast power build-up and more torque at low engine speeds for overall exceptional engine response. 670 Nm of torque is available at 2000 rpm. The overall aim during the construction of the output related components of the ALPINA air intake system – from the so called raw air intake ducts to air filter housings and clean air intake manifold – was to achieve maximum de-throttling. All components of the high-performance cooling system are designed to remove bottlenecks and maximise effectiveness – special large-volume coolers are interconnected by large diameter hosing for maximum throughput. An indirect inter-cooler system (air/water/air) facilitates the implementation of short charge-air intake paths – with a main intercooler supplying the two large volume engine-near intercoolers. Together with additional external water coolers and a transmission oil cooler, the system ensures the thermodynamic stability of the V8 Bi-Turbo engine at all times even under the highest loads and ambient air temperatures. Inside the engine special Mahle pistons and NGK spark plugs are designed to deal with the temperatures and loads associated with 1.4 bar charging and a compression ratio of 10.0:1. The stainless steel ALPINA sports exhaust system is responsible for a reduction in back pressure and weight, its sonorous sound is typically V8. Active exhaust valves allow the driver to influence the sound experience by switching between Comfort and Sport Mode. A typical ALPINA feature: the two twin tailpipes of the exhaust system are integrated elegantly and aesthetically into the rear apron. The new BMW ALPINA B7 Bi-Turbo features the most advanced suspension technology, offering owners an exceptional range of driving experiences. 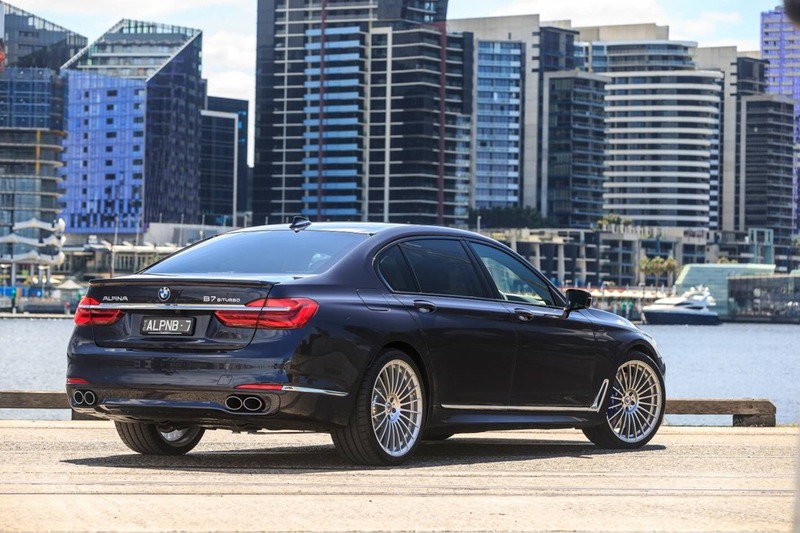 The central objective during suspension development was to retain the unparalleled long-distance cruising comfort of the predecessor while at the same time significantly sharpening the agility, handling and lateral dynamics commensurate to the power output of the new BMW ALPINA B7 Bi-Turbo. The 2-axle air suspension system combined with Dynamic Damper Control and Active Comfort Drive with Road Preview guarantees the very highest level of driving comfort at all times while the Active Roll Stabilization minimises body roll during cornering. The rear wheel steering of the Integral Active Steering system gives the new BMW ALPINA B7 Bi-Turbo a level of dynamic performance and agility not previously associated with performance luxury sedans. The Driving Dynamics Control button serves as the central control with which to select the various parameters that influence the driving dynamics. It also features an Individual Mode, which can be used to combine specific settings independently of each other according to the driver’s preference. 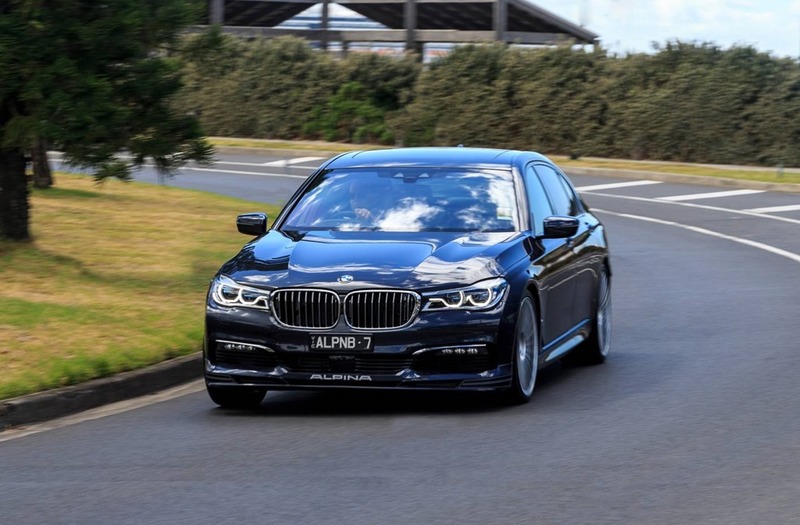 With the Driving Dynamics Control used to select the appropriate Mode, the 2-axle air suspension system is primarily responsible for the exceptional level of ride comfort in the new BMW ALPINA B7 Bi-Turbo. It also allows the ride height to be adjusted up or down which in combination with the other suspension systems facilitates the choice of a decidedly comfort or sport orientated chassis set-up. Overall a maximum ride height adjustment range of 40 mm is available. At speeds above 230 km/h the ride height of the BMW ALPINA B7 Bi-Turbo is lowered by 20 mm. This operating state, which can be activated manually regardless of speed by selecting the special ALPINA Sport+ Mode, results in a lower centre of gravity thereby increasing agility and high-speed stability. Furthermore, the lower ride height results in increased front wheel camber for an even more direct turn-in when cornering. If necessary the ride height can also be raised by 20 mm up to a speed of 35 km/h in order to increase ground clearance. For the first time, the new BMW ALPINA B7 Bi-Turbo features Integral Active Steering which in conjunction with the high-performance drivetrain offers a dynamic driving experience par excellence. The Integral Active Steering combines a variable ratio electric steering system at the front axle with active steering on the rear axle whereby the wheels can turn a maximum of 3 degrees. Specially attuned to the ALPINA suspension and MICHELIN performance tyres the rear axle steers opposed to the front axle at low speeds for increased agility and dynamic handling, while steering with the front axle at higher speeds for maximum high-speed directional stability. The new BMW ALPINA B7 Bi-Turbo is fitted with MICHELIN Pilot Super Sport tyres measuring 255/35 ZR21 at the front and 295/30 ZR21 at the rear, mounted on 8.5 x 21 and 10 x 21 ALPINA CLASSIC forged wheels respectively. The new forged wheels take the traditional 20-spoke ALPINA CLASSIC design in a new minimalistic and technical direction. Forging results in high-density and high-strength aluminium alloy which enables a weight-optimized construction that saves 20% of unsprung mass. The MICHELIN Pilot Super Sport tyres are specifically designed to meet the demands of high-performance sports cars. They contribute directly to the precise steering feel and handling of the new BMW ALPINA B7 Bi-Turbo while foregoing run-flat technology in the interests of improved ride comfort. Comprising blue painted 4-piston fixed callipers and 395 x 36 mm discs on the front axle and floating callipers with 370 x 24 mm discs on the rear axle, the high performance brake system provides outstanding stopping power and deceleration. Power transmission in the BMW ALPINA B7 Bi-Turbo is taken care of by a new generation of the excellent 8-Speed Sport Automatic Transmission with ALPINA SWITCH-TRONIC. Further refined and adapted to the performance characteristics of the high-torque V8 Bi-Turbo in collaboration with ZF, the transmission offers exceptional driving comfort in all situations. A total spread of 7.81:1 improves shift comfort and fuel economy. In Automatic Mode the combination of eight gears and high engine torque makes for relaxed, luxurious cruising at low engine rpm even when travelling at speed. In Sport Mode the shift points are optimized for improved driving performance and gear changes are considerably more dynamic. It is also possible to activate a Launch Control function in this mode. For maximum dynamic performance, the driver selects the Manual Mode thereby actuating gear changes manually by using the SWITCH-TRONIC buttons on the back of the steering wheel. In addition to extremely fast shift times close to a tenth of a second, this mode also supresses forced upshifts in the engine speed limit range. All components of the transmission such as the torque converter with lock-up clutch, the planetary wheel sets and the inner cooling are designed to specifically cope with the high torque output of the V8 Bi-Turbo engine. This means that no torque reduction is necessary during upshifts when utilising Launch Control or when using the sportiest configuration of the Manual Mode. The transmission features the latest Comfort and Efficient Dynamics functions such as Connected Shift (use of navigation data for an anticipatory shift strategy based on traffic routing) and coasting (decoupling of the engine and transmission when coasting). Stylish, elegant and commanding. The appearance of the new BMW ALPINA B7 Bi-Turbo is defined by athletic flair and elegance. The ALPINA design and aerodynamic elements emphasize its performance character, with the front and rear spoiler striking a harmonious balance and highlighting the powerful presence of the BMW ALPINA B7 Bi-Turbo. The design blends form and function – the aerodynamic components reduce uplift on the front and rear axles to almost zero for maximum driving stability at all speeds. Openings at the front of the vehicle allow the precise and effective flow of air to the individual components of the high-performance cooling system. The iconic BMW kidney grille is fitted with an integrated air flap control system that adapts to the BMW ALPINA B7 Bi-Turbo’s cooling needs: when closed it further reduces the level of aerodynamic drag. Engineering craftsmanship meets timeless design. The unmistakable ALPINA CLASSIC 21“ forged wheels with twenty spokes and minimalist, athletic design reduces unsprung mass. This results in a maximum of dynamic handling, an optional turn-in as well as enhanced comfort. The ALPINA sports exhaust system features two elliptical twin tailpipes that reflect the performance of the new BMW ALPINA B7 Bi-Turbo and its powerful V8 engine. They are precisely integrated in the rear apron and give the rear a smooth, elegant look. The exclusive paint finishes in ALPINA Blue metallic and ALPINA Green metallic are a hallmark feature reserved solely for BMW ALPINA automobiles. Other BMW and BMW Individual paint finishes are likewise available for the new BMW ALPINA B7 Bi-Turbo. The interior of the BMW ALPINA B7 Bi-Turbo offers a luxurious ambience, exquisite materials and design. An extensive range of standard equipment ensures maximum well-being and comfort, including high-end Nappa leather, comfort seats, a leather-covered instrument panel, ceramic applications on selected control elements and soft close doors. Equipment features that further support effortless driving also come as standard in the new BMW ALPINA B7 Bi-Turbo, such as a full-colour Head-Up Display and a rear view camera. 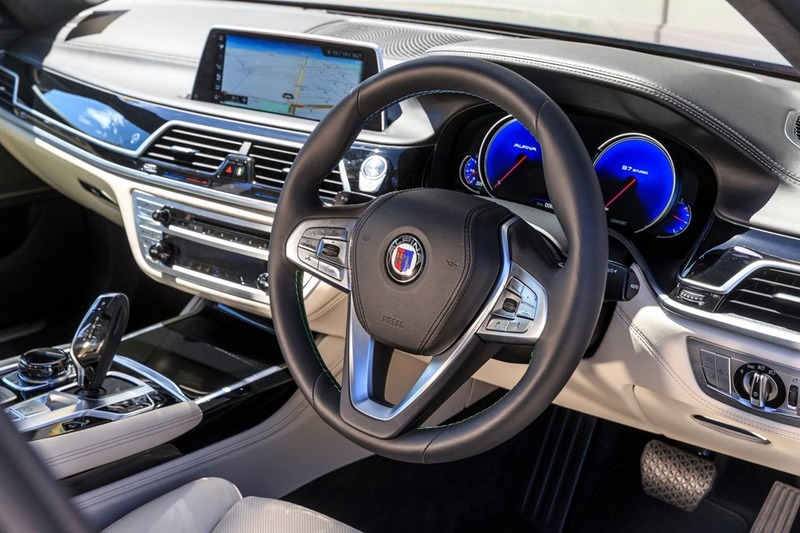 The standard equipment also includes the latest BMW navigation, communication and infotainment systems which set the benchmark with innovative and intuitive operating controls. The Comfort Rear Seats include heating and are electrically adjustable in several ways. The fore-and-aft position of each of the individual seats can be adjusted by up to ten centimetres. The backrest angle adjustment ranges from an upright position to a relaxed comfort position with a 45° flat angle. The rear seat Comfort Headrests are also individually electrically adjustable, and feature a removable Alcantara Comfort cushion. The control units for the two comfort seats are located on the centre armrest in the rear. Plus, the memory function allows two individual configurations to be saved and restored at the push of a button. To provide an even more luxurious and generous sense of space for the rear seat passengers the Sky Lounge panoramic glass roof includes an electric roller sunblind, a slide and tilt function for cabin ventilation and an unprecedented LED-based lighting installation comprised of over 15,000 lighting elements in the glass part of the panoramic roof. It enables occupants to enjoy an especially luxurious, individually adjustable lighting ambience after dark, in the colour scheme of the ambient lighting selected. The Rear-seat entertainment Experience equipment guarantees great entertainment for the rear seats. Rear-seat entertainment Experience is operated using BMW Touch Command. It includes two 10″ colour displays on the rear side of the front seat backrests. It also includes a Blu-ray player, an HDMI connection for mobile devices, as well as various connections for MP3 players, game consoles, etc. Up to three sets of headphones can be connected via the integrated wireless interface. In combination with the rear massage seats, the Vitality Programme can also be used with the equipment Rear-seat entertainment Experience. The Massage function for rear-seat passengers increases the feeling of well-being by specifically stimulating or relaxing muscles. There are up to eight different massage programs available including pelvis activation, torso activation, full-body activation, back massage, shoulder massage, loin massage, torso training and full-body training. In addition, the Vitality Programme provides active body training with three intensity levels, which relaxes and regenerates the muscles on long journeys. BMW Laserlight, which includes BMW Selective Beam, represents the latest in headlight technology. In laser high beam mode, BMW Laserlight illuminates a range of up to 600 metres − nearly twice as far as that of conventional headlights, improving safety with better night time visibility. Discreet ALPINA details add a touch of exclusivity and individual style to the interior. Hand-finished using exceptionally high-quality LAVALINA leather, the sports steering wheel with blue and green stitching is captivating at the very first touch. Timeless Piano lacquer or classic Myrtle Luxury Wood – the ALPINA interior trim, door sills with blue illumination, B7 model inscriptions and an individual production plaque are further examples of exclusive equipment features in the new BMW ALPINA B7 Bi-Turbo. An absolute highlight is the full-colour digital instrument panel in LED technology featuring an exclusive ALPINA design. In Comfort Mode it offers a classic look featuring round instruments with blue background and red needles. In Sport Mode the display changes to a more dynamic design with blue and green drag indicators and a focus on primary information, such as the centrally positioned permanent digital speed read-out. A mechanical limited-slip differential, developed specifically for ALPINA by Drexler Motorsport, is available as a dealer-fitted cost option on the BMW ALPINA B3, B4 and B7 models. Drexler Motorsport is a world leader in the design and manufacture of innovative drivetrain components. Based in Germany, the company’s main business activity centres around the production of limited-slip differentials for use in motorsport, performance cars and special one-off applications. 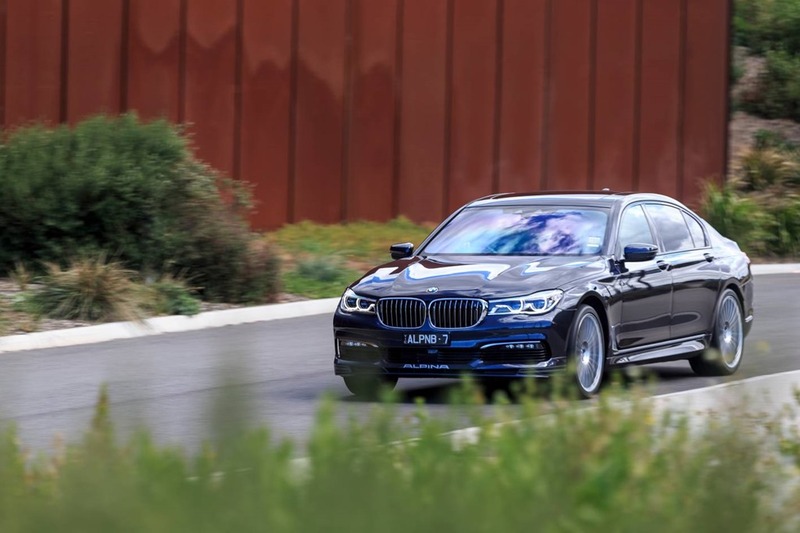 With approximately 20% of all ALPINA vehicles sold in Europe fitted with a Drexler LSD, it is anticipated that this number will be higher in the Australian market.